The Nanday Parakeet (Nandayus nenday) is also known as the Black-hooded Parakeet or Nanday Conure. The bird is native to South America from southeast Bolivia to southwest Brazil, central Paraguay and northern Argentina, from the region known as the pantanal. Caged birds have been released in some areas and the birds have established self sustaining populations in the Los Angeles, California, and several areas of Florida (including St. Petersburg, Broward County, and Miami-Dade County). 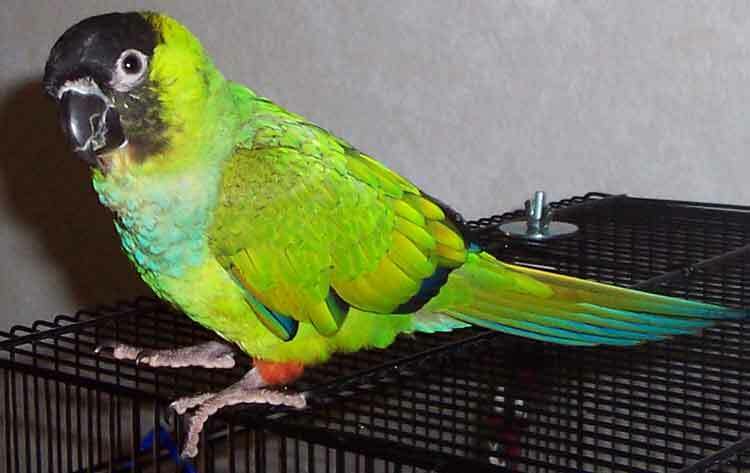 The Nanday Parakeet is 32–37 cm in length, and is mostly green in color. Its most distinguishing characteristic, for which it is named, is its black facial mask and beak. It also shows black trailing flight feathers on its wings and has a long tail edged at the end in blue. The upper chest is bluish-green and the lower chest is a paler green. Feathers covering the thighs are red. In captivity they make wonderful pets if cared for and socialized properly. They all have distinct personalities and appreciate toys. They require a cage or enclosure that is a minimum of 24x24x30 inches as they are inclined to climb, flap their wings and have long tail feathers. They also like to be outside of their cage at least six hours a day. While they will accept most parrot seed mixes, seed-only diets are nutritionally inadequate, reduce their lifespan considerably and may cause them to become underweight. Pellet-based diets with fruits and vegetables offered daily are much preferable. These birds are extremely intelligent and skilled escape artists. Some of them will talk, others will not, depending on their personality. They are noted for having a very loud call and are not suited for apartments. Fearing the birds may escape and become feral agricultural pests, the state of Tennessee, USA bans the keeping of Nanday Parakeets as well as Monk Parakeets.